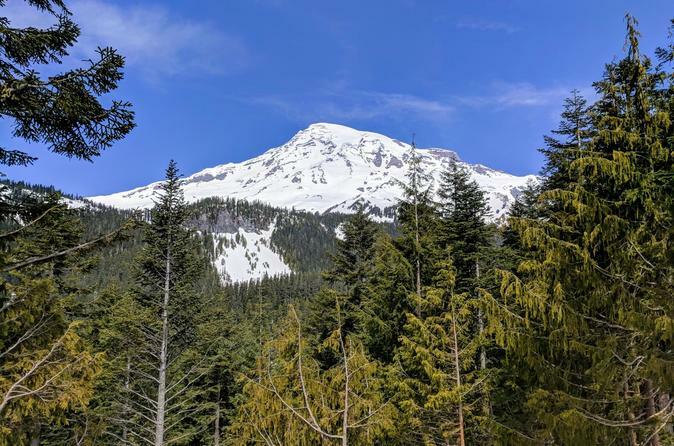 Explore pristine alpine meadows, wander through magical old growth forests, and watch roaring glacial waterfalls crash into rugged canyons on this small group day tour to Mount Rainier National Park. The snowcapped peak, encased in over 35 square miles (91 km²) of ice year-round, is endearingly referred to locally as “The Mountain” and is a must-visit Seattle day trip. Throughout the day, you'll enjoy meaningful commentary on the history, culture, and geology of the region from an expert local guide. The tour includes a gourmet lunch, park admission, and pick-up/drop-off at your Seattle hotel in our luxury Mercedes van. Our Mount Rainier National Park tour begins with morning pick-up at your hotel in our eight-passenger Mercedes van. While driving to the park, we'll enjoy coffee, tea, and pastries while taking in picturesque Pacific Northwest scenery. During the ride, your guide will discuss the fascinating history, culture, and geology of the region. Once we arrive at the park, we'll visit Paradise, famous for its gorgeous wildflower meadows. Weaving paths through this alpine environment offer fantastic views of Mt. Rainier towering above. Weather permitting, we’ll take a short guided walk to Myrtle Falls, a waterfall tumbling into a rugged gorge in the shadow of the peak. Your guide will prepare a gourmet locally inspired lunch with complimentary beverages. Continuing from Paradise, we’ll pass Reflections Lake to snap the perfect photo of Mount Rainier reflected in the glacial lake. Farther down the mountain, we’ll walk amongst giants at the Grove of the Patriarchs. This area contains some of the most spectacular old growth forest along the banks of the Ohanapecosh River. An optional guided nature walk leads to some of the largest trees in the park. On the comfortable ride home, relish the memories and photographs from a great day. Hotel pick-up/drop-off, park admission, and food and drink are all included. Please note that our guides optimize every tour based on the season, weather conditions, and guest interest, so exact stops in the park are subject to change.